Revolutionary in its day, the full-size Jeep pickup saw a long production run, from 1963 to 1987. Here, we look at the first generation of the full-size Jeep pickup, which, at times, seemed to have nine lives. With ongoing speculation that Jeep might re-enter the pickup truck market with a Wrangler-based pickup — either 2005’s Gladiator or this spring’s J-12 — it’s a good time to review the history of the original Jeep Gladiator, introduced in 1962. The Gladiator full-size pickup was ahead of its time in many ways. It was marketed and sold primarily as a four-wheel-drive truck, yet it was offered with an innovative single-overhead-cam six-cylinder engine and independent front suspension that was advanced for its time. The history of the Gladiator starts with the Jeep pickup that preceded it, which was built off the chassis of the 1946-62 Jeep station wagon. A rugged and reliable truck, the Jeep station wagon and pickups were a four-wheel-drive alternative to the Spartan Jeep CJs from that era. With simple and robust drivetrains, they competed against few vehicles in the emerging four-wheel-drive marketplace, one that was moving from its utilitarian postwar beginnings toward dual-purpose trucks aimed at a growing recreational market. In the late 1950s, Jeep designers and engineers were already looking forward to develop a platform that would end up serving four different corporate masters – Willys Motors, Kaiser-Jeep, American Motors Corp. and Chrysler – over the next three decades. The chassis for the Jeep Gladiator (SJ platform) was developed concurrently and shared with the granddaddy of the modern SUV, the Jeep Wagoneer. 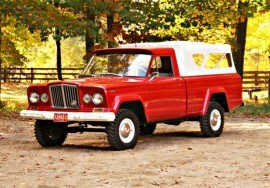 Although the overall Wagoneer/Gladiator design was often attributed to industrial designer Brooks Stevens, in reality his main contribution to the design was the upright grille, often referred to as the “rhino grille” found on the early 1963-65 Wagoneers and the Gladiator trucks up to 1970. In 1971, after Jeep was purchased by American Motors, the Gladiator adopted what was then the full-width, vertically slotted grille found on the then-current Wagoneer, which got a more upscale grille itself. Many Jeep enthusiasts don’t realize that when the Gladiator was introduced, it had two innovations that set it apart from its competitors besides being engineered from the ground up for four-wheel drive. (Two-wheel-drive Gladiators made up a small percentage of overall sales.) First was the overhead-cam 230 Tornado six-cylinder engine. It was the first mass-produced U.S.-designed overhead-cam engine, introduced before Pontiac’s Sprint OHC Six in 1965. It was an update of Willys’ 226 Hurricane flat-head six that was a mainstay of the Jeep lineup from 1954 to 1962. While the OHC Tornado Six was an economical engine with good low-end torque, it developed a reputation for oil leaks that led to undeserved warranty headaches. It was replaced halfway through the 1965 model year with AMC’s new overhead-valve 232-cubic-inch Six. This basic engine architecture served for four decades in a variety of Jeep products, all the way to 2006, when the fuel-injected 4.0-liter version in the Jeep Wrangler was replaced by a Chrysler V-6, a move that many Jeep purists lament to this very day. While Jeep trucks have a well-deserved reputation for durability because of their robust front solid axles and Dana drivetrain components, one of the innovations introduced on the 1963 Gladiators was a unique independent front suspension. The 1963 brochure described it this way. SUSPENSION SYSTEM: For better handling and improved ride, the all new “Jeep” Pick-up Trucks are available with an advanced-design independent front suspension system – a “Jeep” exclusive in 4-wheel drive. Front driving independent wheel axle with protected torsion bars and enclosed axle shafts provide the ultimate in extra 4-wheel drive traction and still retains unparalleled comfort of front independent suspension. And don’t bother to look for this feature on competitive 4-wheel drive trucks … you won’t find it. Like the OHC Tornado six, this $160 option lasted just a few years before being discontinued at the end of the 1965 model year, making it (like the IFS) a quiet footnote in full-size Jeep history. While rare, an original Gladiator equipped with the Tornado six and IFS isn’t considered collectible by anyone but a full-size Jeep purist. In all my years in the Jeep community, I’ve never seen a Gladiator with the SOHC six and IFS, as most Gladiators were built with the standard solid-axle setup. In fact, I’ve seen only one Wagoneer with IFS. But just to prove that Willys and Kaiser built such a beast, check out Bruce Rice’s 1963 Jeep Wagoneer over on John Meister’s website. What really made the Gladiator unique in 1963 was its combination of four-wheel drive with an automatic transmission. The transmission offered was Borg-Warner’s AS-8W heavy-duty three-speed automatic. In 1963, not even Chevy, Dodge, Ford, GMC, or International offered such a combination. It’s almost as if the engineers in Toledo could see the personal-use, recreational 4X4 pickup truck on the horizon and decades later housewives would use their three-ton heavy-duty pickups to run down to Costco for bulk purchases of groceries. Without a V-8 in its lineup, Jeep certainly lost potential sales to its Big Three competitors in 1963 and 1964, as the Gladiators were ill-equipped to carry big loads or tow increasingly larger boats and travel trailers. This was addressed in 1965 when Kaiser began to offer AMC’s 327-cubic-inch V-8. Not to be confused with the small-block Chevy with which it shares nothing but its displacement, the AMC Vigilante V-8 addressed the Gladiator’s biggest shortcoming, horsepower, and served to forge strong commercial ties between Toledo, Ohio, and Kenosha, Wis. The result ultimately was AMC’s purchase of the Jeep brand from Kaiser in 1970. The AMC V-8, which dated back to the mid-1950s, was almost perfectly suited for the Gladiator. It was a low-revving, high-torque engine, but as AMC was moving to a new family of thin-wall, small-block V-8s, it was discontinued after the 1967 model year, replaced by a 230-horsepower, 350-cubic-inch V-8 supplied by Buick. But after AMC bought Jeep, the entire full-size Jeep lineup, trucks and Wagoneers, was engineered in a crash program to use AMC’s 304-, 360- and 401-cubic-inch V-8s in place of the Buick 350. By the time of the AMC takeover, the Wagoneer SUVs were the true prize in the acquisition. To AMC’s credit, after switching over the Gladiator moniker to J-Truck in marketing its line of full-size pickups, the company did whatever it could to continue to update the pickup trucks alongside the Wagoneer. Throughout the rest of its production run, AMC offered a number of option packages, like the Honcho that ran from 1976 to 1983. Chrysler almost immediately discontinued production of the full-size Jeep pickups, competing as they did with Dodge’s poor-selling pickups. But the AMC era of the full-size Jeep truck story is best left to the next article in this series. 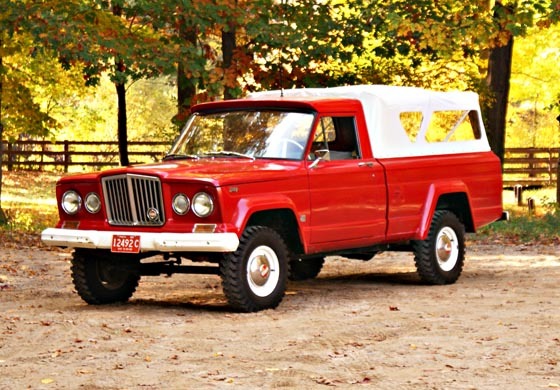 If you want to see a well-preserved example of an early Jeep Gladiator, look no further than Frank Sanborn’s 1965 Gladiator. Well, it’s a Gladiator in that it was first titled in 1965, but the vehicle identification number indicates that it was built in 1963, according to Sanborn. “It’s a pretty unusual truck being a 4,000-pound GVW two-wheel-drive truck,” he says. “The truck was originally purchased in early 1965 by a potato farmer in Munger, Mich., and was in use on his farm until 1999,” Sanborn says. “I bought the truck in 2000 from the second owner and have done a lot of mechanical work to keep it on the road. It had 44,000 miles on it when I got it and now has just turned 60,000. The original owner had repainted the truck himself in the mid-‘90s. With plans for sympathetic restoration and cleanup, Sanborn has all the makings of a true survivor, representing a different era of the classic American pickup truck. “I don’t want to make it so nice that I’m afraid to drive it or use it as a ‘truck’. It’s most happy when it gets to actually do some work,” says Sanborn. The Jeep Gladiator, along with the companion Wagoneer, has a large and vibrant community online. If you want to learn more about these remarkable trucks, visit the International Full-Size Jeep Association, as well as Wagoneers.com hosted by John Meister. For additional reading, check out this complete dealer brochure for the 1963 Gladiator.